Spaniards make up an important and varied European population that has contributed and received gene flow widely throughout history and prehistory in the Old World and New World. The Spanish population data represent 401 DNA samples from unrelated individuals from all over the Kingdom of Spain. Samples were provided by a) the Laboratory of Criminalistics – Criminal Investigation Command, in the Spanish capital of Madrid, b) the Laboratory of Genetic Identification in the Dept. of Legal Medicine at Spain’s University of Granada, and c) the FBI Laboratory at the FBI Academy in Quantico, Va. The Spanish – Minorcan (also spelled Minorcan) population data represent DNA samples from 100 unrelated individuals on Minorca (Minorca) — one of the Balearic Islands (Balearic_Islands) in the Mediterranean Sea, which mark the easternmost part of the Kingdom of Spain. Minorcan Spanish are predominantly Catalans. Catalans live today in one of Spain’s autonomous regions, where their language is official and recognized by the government. Catalonia also extends to the Balearic Islands and other islands off the Iberian Peninsula. Samples were obtained by the Genetics Laboratory of the Biology Dept. at the University of the Balearic Islands. For more details on this population, see: www.menorca.islasbaleares.com; Balearic; www.red2000.com; www.menorca.net, and Catalan_people. The Spanish – Valencia population data represent DNA samples from 101 unrelated individuals from Valencia, one of the largest cities and an autonomous community of three provinces on the eastern coast of the Kingdom of Spain, the nation’s official title. Samples were obtained by the Genetics Laboratory of the Biology Dept. at the University of the Balearic Islands. For more details on this population, see Valencian_people; Valencian_Community; Kingdom_of_Valencia, Spain-Valencia; Valencia,_Spain and valenciavalencia.com. The Spanish – Cantabria population data represent DNA samples from 158 unrelated individuals living in various parts of northwestern Spain’s mountainous coastal region of Cantabria (Cantabria), in the officially titled Kingdom of Spain. Cantabria is bordered on the east by the Basque Autonomous Community (province of Biscay), on the south by Castile and León (provinces of León, Palencia and Burgos), on the west by the Principality of Asturias, and on the north by the Cantabrian Sea (Bay of Biscay). Altamira Cave is located in Cantabria. Spanish – Galicia represents 122 unrelated Galicians who were sampled in 1999 by the Universidade do Porto, Portugal. Galicia is the province of Spain above Portugal in the northwest corner of the Iberian Peninsula. Galician music has some affinities with Gaelic or Irish traditions, as recorded by The Chieftains in one of their albums. Celts lived in both places in deep history. Spanish –Extremadura represents 143 unrelated individuals living in Extremadura Spain who were sampled in 2003 by the Instituto Nacional de Taxicologio in Sevilla, Spain. Extremadura is in central western Spain. Its component provinces are Cáceres and Badajoz. It is bordered by Portugal to the west. To the north it borders Castile and León (provinces of Salamanca and Ávila); to the south, it borders Andalusia (provinces of Huelva, Seville, and Córdoba); and to the east, it borders Castile–La Mancha (provinces of Toledo and Ciudad Real). Spanish – Northeast represents 204 unrelated Caucasians from Northeast Spain who were sampled in 2003 by Instituto Nacional de Toxicologia in Barcelona, Spain. The Northeast section of Spain includes Navarre, Aragon and Catalonia. Spanish represents 342 unrelated individuals from the 17 autonomous communities of Andalucia, Aragon, Asturias, Islas Baleares, Islas Canarias, Cantabria, Cataluna, Extrea Mancha, Castilla y Leon, La Roija, Madrid, Murcia, Navarra, Pais Vasco, and Valencia who were sampled in 2006 by the Universidad Complutense in Madrid, Spain. The Spanish population data represent DNA samples from 449 randomly selected, unrelated individuals of Spain. STR frequencies were reported in the most recent European database release of the Working Group of the European Network of Forensic Institutes STRbase Project (http://strbase.org/frequencies). Photo: Salvador Dalí was a Spanish surrealist painter who lived in Catalonia, Spain. 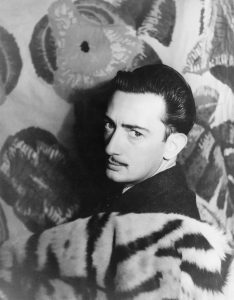 Photo from Carl Van Vechten photograph collection at the Library of Congress. Photo on Wikimedia Commons. Source publications: Spanish Population Data (population 83) on Nine STR Loci, JFS, 2001, p1003-1004. Allelic frequencies of the 15 STR loci included in the AmpFlSTR Identifiler PCR Amplification Kit in an autochthonous sample from Spain, FSI, 2007, p241-245. Spanish- Valencia (population 116): STR Data For The AmpFlSTR Profiler Plus Loci From Majorcan, Minorcan And Valencian Populations (Eastern Spain), FSI, 2001, p201-20. Spanish – Majorcan (population 114): STR Data For The AmpFlSTR Profiler Plus Loci From Majorcan, Minorcan And Valencian Populations (Eastern Spain), FSI, 2001, p201-204. Spanish – Minorcan (population 115): STR Data For The AmpFlSTR Profiler Plus Loci From Majorcan, Minorcan And Valencian Populations (Eastern Spain), FSI, 2001, p201-204. Spanish- Cantabria Population Data (population 117): On The Nine STRs From Cantabria, A Mountainous Region In Northern Spain, FSI, 2001, p175-177. Spanish- Galicia (population 123): Genetic Diversity of Nine STRs in Two Northwest Iberian Populations: Galicia and Northern Portugal, IJLM, 2000, p109-113. Spanish- Extremadura (population 265): Allele distribution of 15 STRs in a population from Extramadura (Central-Western Spain), Progress in Forensic Genetics 9, 2003, p165-169. Spanish – Northeast (population 281): STR frequencies for the PowerPlex 16 System Kit in a population from Northeast Spain, FSI, 2003, 135, p75-78. Spanish (population 341): Allelic frequencies of the 15 STR loci included in the AmpFlSTR Identifiler PCR Amplification Kit in an autochthonous sample from Spain, FSI, 2007, p241-245. Spanish (population 452): ENFSI DNA WG STR Population Database v. 2. (strbase.org).